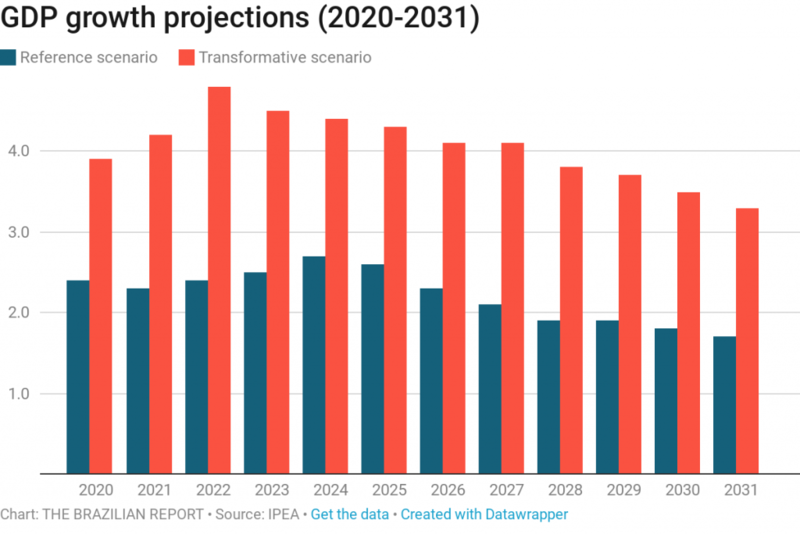 Long-term scenarios can be a valuable tool to help economic actors evaluate costs, risks, and opportunities within a country. In a moment where the Brazilian federal government is haunted by fiscal problems, low efficiency, and problematic regulations, this kind of planning can be even more valuable. According to economists Marco Antônio Cavalcanti and José Ronaldo Jr., from the Institute for Applied Economic Research (Ipea), structural reforms “could give [the economy] a positive push, providing [Brazil] with the minimum tools to gain macroeconomic stability.” Ipea has made predictions about how the Brazilian economy will behave over the next decade, which we will break down as follows. 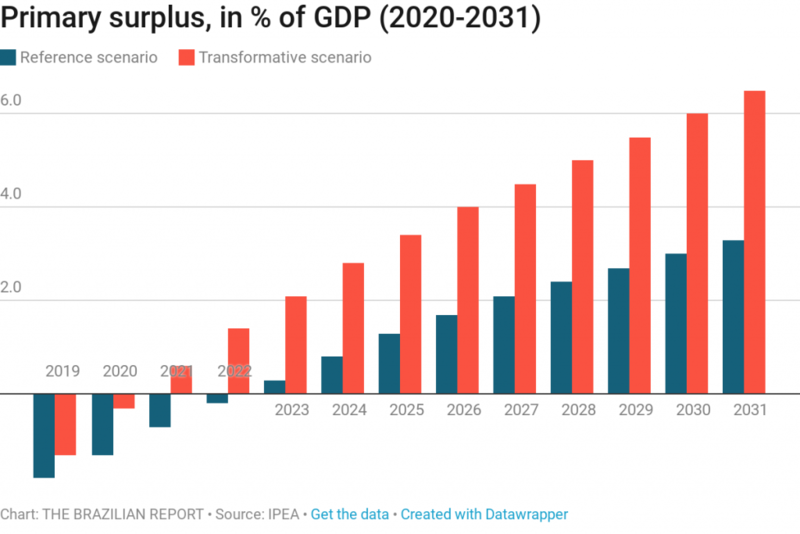 Ipea economists considered three possible scenarios for the 2020-2031 period, varying in accordance with the number of measures Brazil will adopt to have a positive impact on the country’s growth rates and business climate. 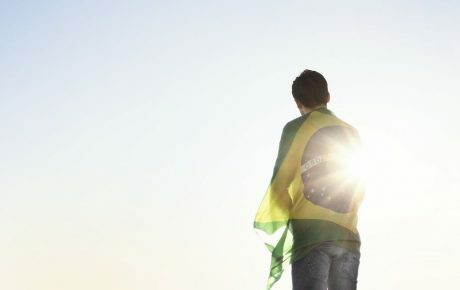 Here, the presumption is that the Brazilian economy will undergo some tax and pension reforms to allow the government to balance to the federal budget in a sustainable way, eliminating the main sources of macroeconomic uncertainty. Microeconomic reforms, however, should advance at a slower pace. 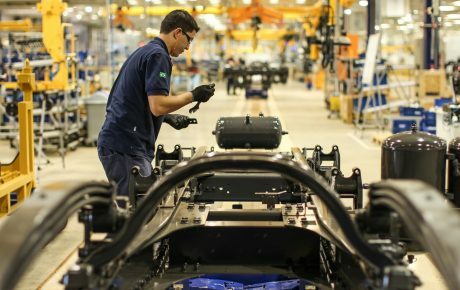 These reforms are necessary for elevating investments and productivity—which means that, in this scenario, Brazil’s growth would stall once its idle capacity is used again. This has been the trend showed by the Brazilian economy over the past three decades. 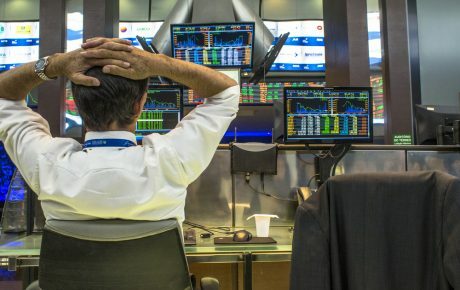 Since 1980, the country has lost 0.5 percent in productivity each year, discounting the growth in human capital (thanks to a better-educated workforce) and in infrastructure capital. 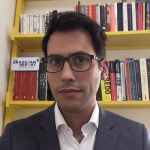 In this scenario, the Brazilian economy would have undergone not only the reforms that would make the country’s fiscal situation viable in the long haul, but also the effective implementation of a wide range of measures aimed at increasing productivity levels and investments in the economy. 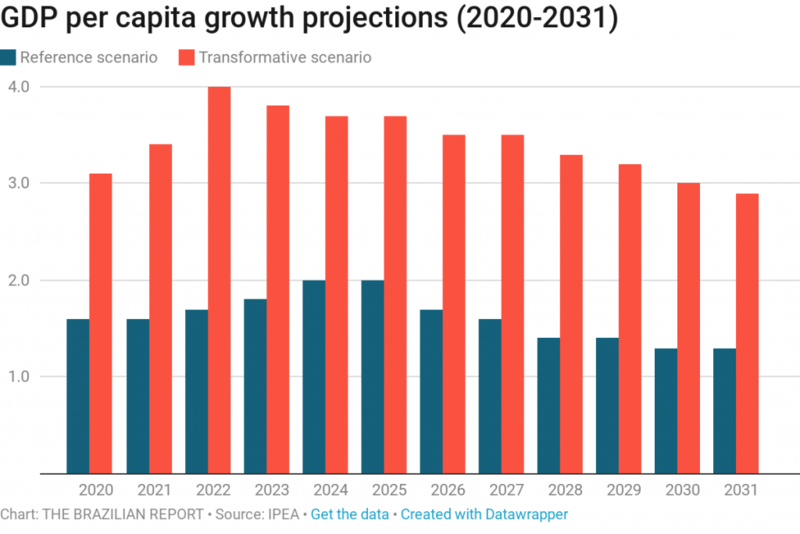 Furthermore, this scenario adopts optimistic projections for the increase in educational levels and human capital, which result in higher long-term growth rates. 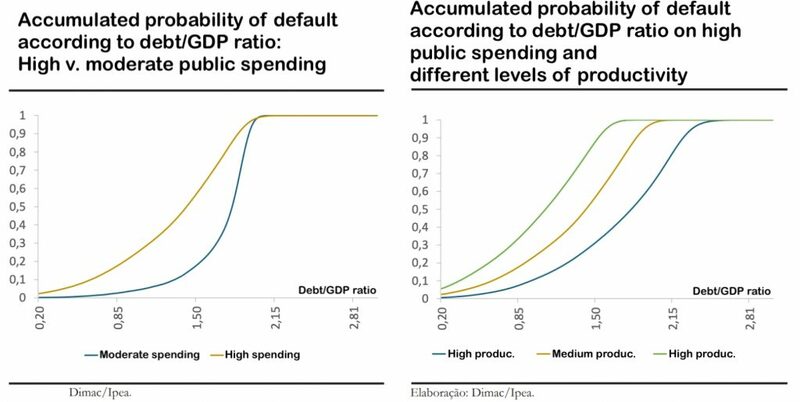 This is the scenario in which the necessary fiscal reforms are not adopted. In their absence (or if the reforms are insufficient), it will be impossible to contain the mandatory expenses of the federal budget—especially when it comes to pensions. 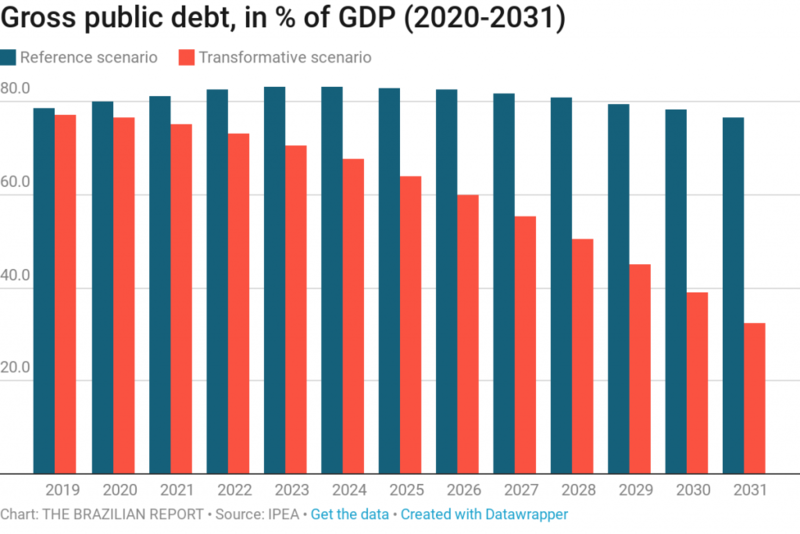 Public spending would continue on an explosive trajectory, which would draw a lack of confidence from investors and enhance the risks attributed to the Brazilian economy. As an emerging economy that is highly dependent on commodity exports, Brazil is vulnerable to external pressures. 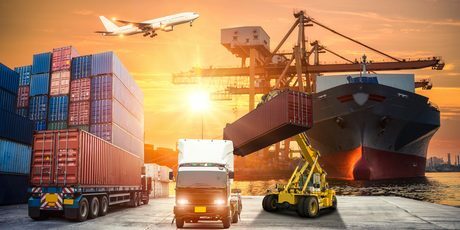 According to the International Monetary Fund (IMF), the risks of global negative growth have grown over the past few months. “Global conditions are changing in terms of the risk metrics,” Jihad Azour, director of the Middle East and Central Asia at the IMF, told CNBC. “Although we’re still enjoying a high level of growth, that growth is plateauing,” he added. Higher U.S. interest rates, a stronger U.S. Dollar, and increasing market volatility could put pressure on developing economies. For its report, however, Ipea used a neutral external environment, meaning that their scenarios involve stable commodity prices and capital flows. It also means that tensions from the U.S.-China trade war would wind down. But, as history has shown us time and time again, international crises have major effects on the Brazilian economy. 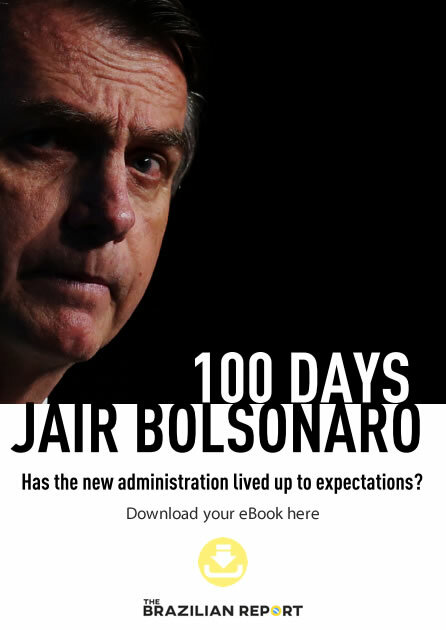 An award-winning journalist with experience covering Brazilian politics and international affairs. His work has been featured across Brazilian and French media outlets. ‘Bolsomania’ has boosted the markets. Can it do the same for the economy?